Yesterday Chim and Samson were able to lead a memorial ceremony on board a vessel that had passed thru the Panama Canal earlier on its voyage to Long Beach. On board the ship there was an Ordinary Seaman (seafarer’ classification) named Robert who complained of a severe headache and high fever. Six days ago, while still at sea, he went to bed with a fever and never woke up again. Robert was a 43-year-old man from the Philippines and he was both a husband and the father of 2 children. The authorities took the body off the vessel in Tacoma, WA, prior to the ship arriving here. The Captain requested Chim to perform the service and also to pray in the room where Robert died. Chim and Samson were glad to do this together as it gave them a great opportunity to offer spiritual comfort to the members of the ship’s staff. At the service Chim invited the crew to speak of their experiences with Robert. That seemingly small gesture gave opportunity for emotional relief to the men on board and brought some closure to many. It was later reveled that Robert had died of Yellow Fever! As you may know, Yellow Fever is a serious and potentially deadly disease that is spread by infected mosquitoes and not person-to-person. The disease usually is demonstrated by flu-like symptoms. The World Health Organization (WHO) estimates that as many as 20 to 50 percent of serious cases result in death. The disease is mostly found around Africa and South America. (Chim and Fay received the vaccine for Yellow Fever when they travelled to Africa early this year.) The disease is preventable but, unfortunately, not curable. Treatment is for relief of symptoms only. The signs come on quickly—usually between 3 to 6 days after an infected mosquito bite. It often starts with headache, muscle and joint pains and fever such as Robert experienced. The "acute" stage lasts only about 3-4 days and then the symptoms go away. The person frequently feels better then (and many people fully recover at this point), however, the disease may really just be in "remission" and get much worse within 24 hours, like Robert. The final stage of this "toxic" phase can turn deadly very quickly. Heart rhythm problems, liver failure, kidney failure, delirium, and seizures are what often prove fatal, as in Robert's case. Chim and Samson were able to offer consolation that touched the crew deeply. The solace presented in II Corinthians 1:3-4, "Blessed be God, even the Father of our Lord Jesus Christ, the Father of mercies, and the God of all comfort; Who comforteth us in all our tribulation, that we may be able to comfort them which are in any trouble, by the comfort wherewith we ourselves are comforted of God" (KJV) was received by many. Please join us in praying for Robert’s family and friends as they grieve his passing. We greet you with the hope that the peace and joy of worshiping our Savior is with you and your loved ones during this wonderful season as we celebrate our Lord's birth. Chaplain Chim is hard at work once again in the ports of Long Beach/Los Angeles. He labors along with Samson Chauhan by visiting many vessels each week offering prayers, Christian services and social services as needed. Last Saturday we had 6 crew members from two separate ship at our home for a home cooked Indian meal. 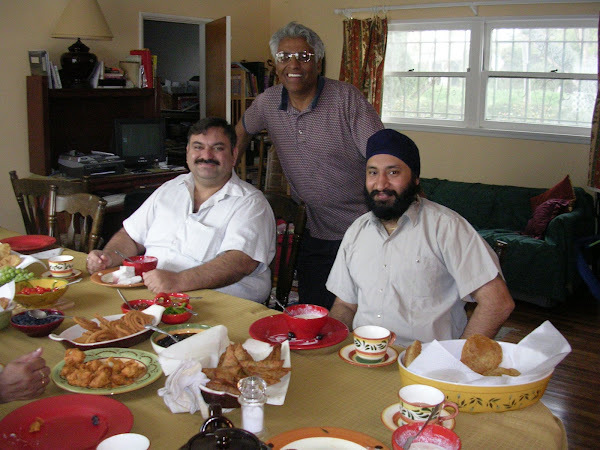 Our visitors enjoyed the food and were surprised by our "American" hospitality. Later in the week we had the pleasure of celebrating the birthday of Angie Nelson, LMM board president's Ron Nelson's wife, with a Mexican meal followed by a wonderful game or two of Mexican Train Dominos. It was a very nice time for us but Chim had to leave early to collect some seafarers' from their shopping trip in Lakewood. We would like to take this opportunity to thank those of you who support LMM by sharing your interest in this organization and with your prayers and financial funding. Our next LMM board meeting is scheduled for January 4, 2012, at 10:00am and you are cordially invited to attend. It will be held in our home, Lord willing, at 3901 Maine Avenue, Long Beach, CA 90806. We offer light refreshments at all our meetings and we'd love to see you.